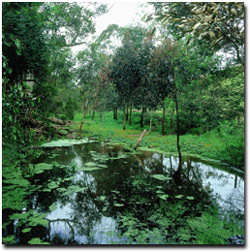 Riparian land is any land that is next to, or directly influences a body of water. It includes areas adjacent to creeks and rivers, gullies and dips which sometimes run water, wetlands or areas surrounding dams and lakes. Walk along a creek during winter and see where the majority of water is entering waterways. It may be that most of the water follows drainage lines or low areas. If so, fence up (part or all) of the drainage line to slow the water prior to entering the riparian zone. This will allow it to filter through the drainage line and riparian zone instead of rushing straight past it. Where possible avoid direct stock access to a stream. If possible connect troughs to a permanent water supply such as a dam or reticulated water supply rather than from the stream. If necessary provide access points (e.g. concrete, gravel etc) in certain areas and fence the rest. 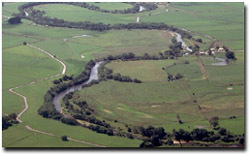 Benefits of well-managed intact riparian zones include: shelter for stock and pasture; improved water quality; improved habitat & wildlife; decrease in insect pests; opportunities for agroforestry; decreased light for algae; recreational area; reduced stream bank erosion, improved aesthetic value. Anecdotal evidence indicates that good riparian zones can increase property value by 10%. Retain and improve existing frontage vegetation. Grow vegetation on the bank itself (smaller trees near the bottom) to aid in stabilising it, and providing shade shelter for aquatic life in the water. Allow snags to remain in streams to provide habitat. Riparian vegetation should include indigenous grasses, reeds and shrubs as well as trees. Riparian vegetation will also provide stock and surrounding pastures with shelter. This may improve production and sustainability of the surrounding land. If a crown frontage lease applies, then reduced rentals are available if ungrazed.